Above are process shots of my first batch of eco printed scarves. This past November I participated in Hamilton Artist Inc's Craft Mart. These scarves were one of the items I sold at the show. Last April I assisted Sheridan College's Textile Studio Technologist Janelle Guthrie with her Alternative Methods of Natural Dying Workshop. In this workshop we focused on rust dying, eco printing and botanical pounding. The results were amazing and as I continue to explore these techniques I keep unwrapping the most beautiful surprises. Eco printing makes stunning surface designs and patterns. Working with natural dyes takes a lot of dedication and patience, I've worked with different natural dying techniques for almost a year now and I'm just beginning to get the hang of it. For my final year at Sheridan I have only worked with natural dyes and will continue to use it in my thesis work next term. 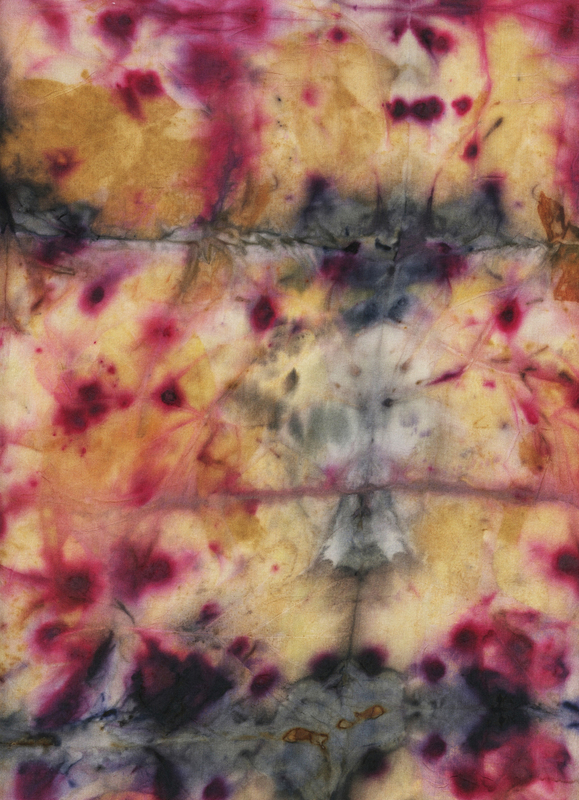 Yesterday I read two great articles about natural dyeing, one from my prof Thea Haines and one from India Flint, I highly recommend both of them. If you are interested in owning one of these eco printed scarves there are still some left at Hawk and Sparrow on James Street N in Hamilton. Stay tuned for more post about my natural dyeing explorations!